Aber station lay near the village of Abergwyngregyn, between Llanfairfechan and Bangor. 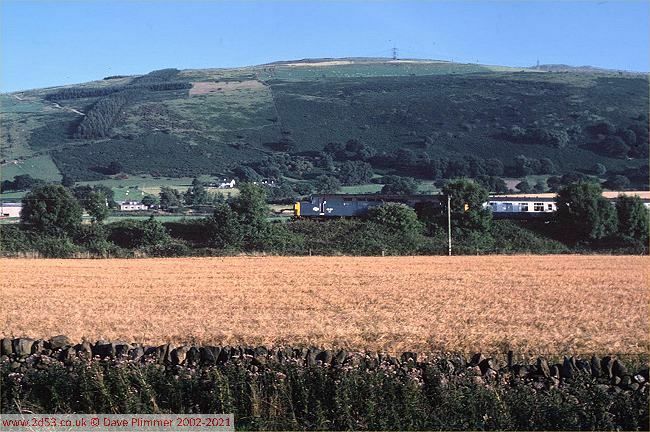 Although the station closed in the sixties, the signal box remained to break up the section between Penmaenmawr and Bangor. The box was open on the day shift only, and as well as the signals (all semaphores), controlled a crossover and a down refuge siding. The box has now gone, replaced by intermediate block signals controlled by Bangor and Penmaenmawr. 40186 passes on the 14:30 SO Crewe to Holyhead on 3rd September 1977, on one of the few Saturdays-only trains that didn't run to Llandudno. To the left of the train is the LNWR-built signal box, whilst the old station building is on the right, but hidden by the train. The down refuge siding was used occasionally to store wagons. 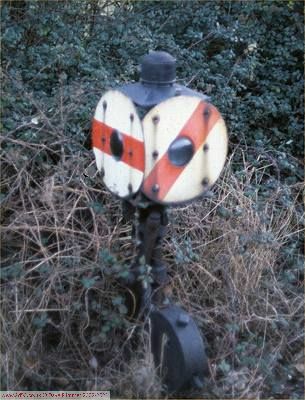 The exit from the siding was controlled by this LNWR vintage shunting signal. The whole assembly rotated to display the alternate face when it was 'off '. 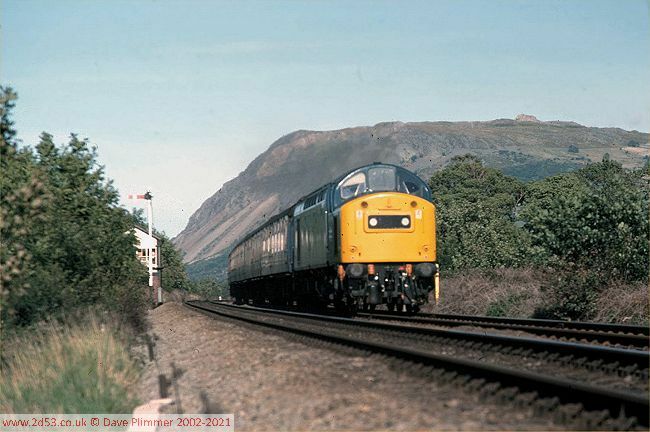 25302 is seen passing Aber on 27th August 1979 whilst working the 15:45 from Manchester Victoria to Bangor. 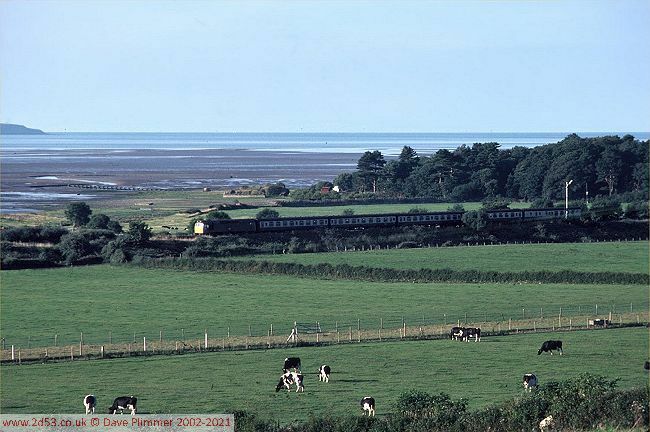 This train passed Aber at about 18:15, so the signal box would have been 'switched out' by this time with all signals at clear, and the section would have been Penmaenmawr to Bangor. This diagram started and ended at Manchester and was usually a Class 40 turn, but 25's, 47's and even the odd Peak could turn up. On the same evening, 40127 passes in the opposite direction, working the 18:05 Holyhead to London Euston. 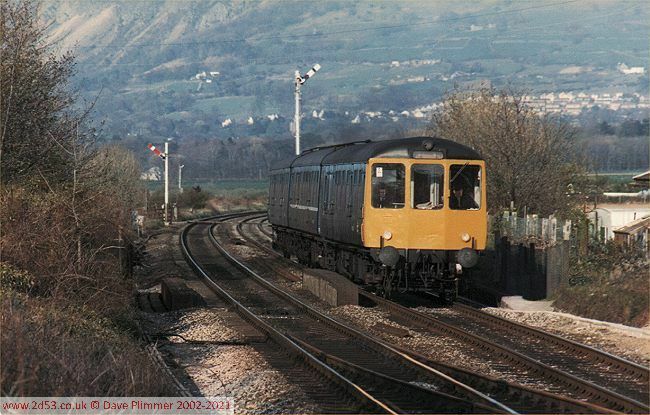 A BRCW three car dmu passes on the 15:42 from Manchester Victoria to Bangor on the 17th April 1982. This was normally a loco hauled working, but on this day this Newton Heath based set was used. The white band on the centre car indicates it is from a Manchester-Blackpool set. BRCW sets at one time had a regular working to Bangor on the 16:34 'Club Train' from Manchester Victoria and the 07:15 return from Bangor. All signals are 'off' including the down distant, seen in the distance.